The Buddhist monk Mabima Pangananda is knowledgeable about rituals in agriculture such as seed selection, land preparation for sowing, and determining the right moments for sowing and harvesting. The Buddhist priest was just about leaving the temple of Kataragama in the south of Sri Lanka. When he learned about the aim of our visit, he decided to stay and take time for a lengthy dialogue with us. As our aim is to assist farmers to revitalise and to field test ancient knowledge, including its spiritual techniques, we wanted to ask the spiritual leaders for support. Monks and priests possess invaluable knowledge about indigenous techniques such as charming water and sand. They can also possibly train shamans and village priests and develop methods for testing and valuing traditional practices. The priest Mabima Pangananda is knowledgeable about such agricultural rituals as seed selection, preparing land for sowing, and determining the right moments for sowing and harvesting. During our visit it became clear that he is very willing to train the village shamans. He was pleased with our interest: until recently, agriculturalists were not interested in spirituality. In this article, we describe how agriculture in Sri Lanka was essentially an integrated system with crops, trees, livestock and fish. Animal and crop production has always been based on three aspects: the relationship with spirits and supernatural beings, astrology, and ecologically-sound practices. We will also indicate how we established a system of field experimentation to test and improve indigenous and effective traditional farming practices. Sri Lanka is a small pear-shaped island to the south of the Indian sub-continent. Altitudes are as high as 3500 meter above sea level giving rise to a varied pattern of rainfall. The several different agro-ecological zones range from tropical forests, to highlands and semi-deserts. The south and southwest regions receive rainfall throughout the year and are referred to as the Wet Zone. The northwest province, the central province, the Uva and the north and eastern provinces make up the dry zone. The dry zone receives an average seasonal rainfall of 75 inches. The northeast monsoons which provide this rain lasts from October till January. The ancient people used the undulating topography to construct wewas or pond-like tanks. In these cascading water reservoirs, water overflows from the top most tanks to those lower down and ultimately flows into rice fields below. In some cases the chena, an agroforestry type of farm on the highlands, was located above the tanks. Cultivation usually began in the highland farms before the onset of the rains. The food security situation was such that in spite of the renovation of almost all ancient irrigation schemes and the construction of new schemes, food self-sufficiency remained a distant dream. Heavy imports were needed to meet grain requirements. This contrasts sharply with the past when the country produced all its food. During the first phase of COMPAS, Upawansa of the NGO Ecological Conservation Organisation (ECO) and other members of the network for agricultural revival documented the importance of cosmovision for farmers in different areas of Sri Lanka. Workshops were organised in which farmers who apply traditional practices based on their cosmovision as well as other resource persons, priests and monks and NGO officials participated and shared their knowledge and experience. Written sources were also consulted. ECO's main objective is to offer Sri Lankan farmers alternatives to modern high-tech and chemical agriculture and protect them from exploitation. Training programmes in ecological farming have been conducted since 1992 for university lecturers, graduates, NGO officials, farmers and students interested in ecological agriculture. The programme deals with indigenous knowledge related to agriculture and includes astrology and the influence of supernatural beings. Most of the traditional practices are used extensively in the north central, northwestern, southern and Uva provinces. In the north and east they are used as well, but with some variations due to Tamil and Hindu influences. In the more developed provinces these practices have largely disappeared due to the extensive use of chemicals. Because of the reaction against the use of chemicals, some NGOs are trying to revive these traditional practices. In the training sessions on eco-friendly practices, farmers bring up the spiritual practices they find effective. The aim is to have farmers testing these indigenous practices so they can be adapted and re-introduced among other farmers. The topic of cosmovision was very well received throughout the country and at present there are farmers groups experimenting with spiritual techniques in five different district of Sri Lanka. Most of them are being helped by NGOs and staff from the Ministry of Agriculture. The majority of Sri Lankans are Buddhists (70%) and 10% are Hindus. People believe in gods and other deities and it is customary to invoke their blessings. The help and blessings of the gods will protect them from dangers, ill health and hardship. Gods inhabit trees and especially the Bo tree (Ficus religiosa). Other ficus species are venerated. Both Buddhists and Hindus construct temples along side Bo trees and make offerings to these trees. It is also believed that there are gods or goddesses protecting rivers, forests and mountains. On the other hand, demons are believed to haunt cemeteries, funeral houses, empty buildings and unclean places. People also believe in a category of spirits that are neither gods nor demons: bahirawas, who are believed to live underground and within air space. Bahirawas are believed to look after the harvest. People believe that a bahirawa can sometimes appropriate part of the harvest, causing losses to the farmers. Therefore, special poojas (sacrifices or offerings) are made to these spirits in the field in order to protect against losses caused by such appropriation. The different spirits are placed in a particular hierarchical order. When gods are angered or not treated properly, deaths, epidemics, quarrels, crop failures, animal losses, and many more disasters occur in society. Bad gods also contribute to such calamities. The hierarchy from the bottom upwards is: the mountains, rivers and trees, through subdivisional gods (gambara), regional gods, national gods and then the four worldly gods: Viruda, Virupaksha, Drutaraksha and Wesamuni. All matter is believed to exist in three physical forms: solid (apo), liquid (theyo) or vapour (vayo). Heat (patavi) determines in which of these three forms any matter exists. The cosmos, which was called akasha, exerts influence on the earth. These five factors are collectively referred to as Pancha Maha Bhuta in ancient literature. Mabima, the Buddhist priest from Kataragama explained his understanding of reality: 'In classical knowledge, upon which both Hinduism and Buddhism are based, reality is understood to function through a multitude of powers and forces. In western thinking, the most important powers are those of matter and energy. According to the theory of Einstein, matter and energy are just different expressions of the same phenomenon. In addition to these, Sri Lankan Buddhism recognizes at least eight different forces and powers: the power of the moment (each moment has its special quality, hence the importance of astrology), the power of a certain location (sacred places, bad places), the power of sound (mantras), the power of symbols (yantras), the mental powers of certain persons (enhanced by training and pious lifestyle), the power of plants (i.e. the powers that go beyond the nutritional or pharmaceutical values), the power of place and space induced by certain events that have taken place there, and supernatural powers that have their origin in spirits or divine beings. It is important to understand all these different powers and know how to relate to them. But also the balance and synergy between these powers is important. This understanding cannot be achieved through mental efforts only. 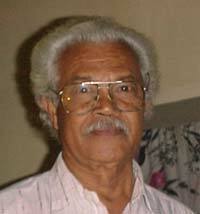 Astrology plays a significant role in the lives of Sri Lankan people. Rural people in particular have great faith in astrology and consult astrologers before embarking on any significant enterprise in their personal, educational or professional life. 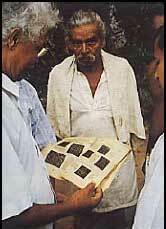 Astrology also plays a dominant role in agriculture, especially in the cultivation of rice. Farmers believe that certain days are good for beginning cultivation. They also avoid certain days which they consider inauspicious or unlucky. Usually a Sunday is chosen to initiate work relating to paddy cultivation. The work is begun on an auspicious day at an auspicious time. Most farmers follow the astrological calendar or pancha suddiya to ensure success and avoid bad luck. Pancha suddhiya involves the following five aspects. Adherence to 'good' and 'bad' days. For example, Thursdays and Fridays are considered auspicious or good days when important undertakings may be launched. The position of the moon in relation to the earth. Twenty-seven such positions or �nekathas are known out of which twelve are believed to be good. Also different nekathas are appropriate for different undertakings. The auspicious hora or one -hour period. Seven horas are identified and each hora is divided into five panchamakala hora (12 minutes). Each of the latter is divided into three sukshama horas of 4 minutes and further sub-divided into periods of 36 seconds each. Avoid facing certain directions on certain days. For example it is believed to be inauspicious to begin any important enterprise while facing the north on a Sunday. Yogini means facing auspicious directions. The evil period. This period is called rahukalaya and one should not begin any important activities at this time. It lasts one and a half hour, and every day there are two such periods. According to traditional practice, agricultural cultivation was a community activity. Individual decisions had to fall in line with communal decisions and the gamarala or village chief saw to it that all collective decisions were adhered to. Cultivation started with the making of a vow to the gods to ensure the success of cultivation. Then cultivation was initiated by the village leader in one area at an auspicious time. These activities were followed by several agricultural practices: minimal tillage of the land; mixed cropping and seeding wherever possible; fencing activities at auspicious moments; crop protection like the cultivation of a small portion of land to attract birds for pest management in paddy, performing kems, a ritual or a religious rite (see below), and if necessary supplement these actions with use of plants or plant extracts (bio-pesticides); Harvesting and heaping in the field for some weeks or months; threshing and separating a small portion for the Mangalya or other festival. Since ancient times rituals have been used in Sri Lankan agriculture to support crop growth and animal husbandry and to chase away wild animals or pests that damage the crops. The combination of spiritual practices, astrology and eco-friendly technologies have become customs. Despite the impact of the green revolution, many of these spiritual practices still exist, but in some instances, their full meaning is not fully understood by the younger farmers. Frequently they are being practised away from the eyes and ears of outsiders. People have learned not to express their spiritual practices openly as they are often ridiculed or condemned by outsiders. Yet, our experience is that once we showed sincere interest in their spiritual practices, farmers were happy to share their experiences with us. One of the most important rituals is the pooja or offering, carried out during the annual festival that is called Mangalya. In many villages this festival is held at the devala, a specific place, usually on the bund of the village water reservoir, the tank. On the day of the festival all items which are collected and purchased are taken in a procession to the devale premises. All men, women and children of the village are expected to participate. In the meantime some poojas are made to God Ganesh. These poojas consist of fruits, specially prepared oil cakes, and other items of food. Milk rice cooked at the place of God Ganesh is first offered to him. Then the milk rice cooked at another location is offered to five gods in a special stage decorated with betel leaves and sheltered with cloth. Offerings are made to two other gods, stages for which are made on either side of the main platform. It appears that one of these gods is responsible for the well-being of animals while the other is the guardian of crops. Finally, two more cups of food including fruits and milk rice are offered to Kadawara, the messenger of the god, who is also considered to be a powerful figure. A successful pooja is believed to usher in prosperity to the village farmers. If something goes wrong during the course of the pooja, the Kapurala (the caretaker or servant) will be punished. This festival is normally performed with a new harvest. There are certain rituals that have to be performed in order to remove curses, the ill effects of black magic, and to prevent crop losses caused by the Bairawas. Sometimes the participants wear masks and use fire torches. There are three major sections to Buddha's teachings. One deals with the discipline of monks or priests; another section refers to the understanding of thoughts, mental activities and the process of thinking; and a third section is known as the Sutta Pitakaya which describes good ways of living. This section consists of many sutras, sermons preached by Lord Buddha. Reciting sutras, which is done to get rid of evil spirits and to invoke blessings, is called pirith. Pirith chanting is used to obtain protection for crops and cultivation. 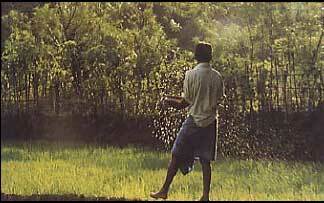 Farmers often chant pirith to prevent or obtain relief from crop diseases, animal epidemics and evil effects. There is nothing secret or confidential about these methods. But one important requirement is that the chanting has to be done by a devout person who leads a pious and righteous life. Fortunately, such people are available in our villages today. They are familiar with traditional religious practices such as charming sand and water for protection against pests. Many farmers in the villages obtain the services of these persons to protect their crops against pests and diseases. Many of them have reported that these traditional religions methods have proved to be more effective than chemical pesticides. A mantra is a certain type of verse, a combination of carefully selected sounds that together create a nucleus of spiritual energy. It functions as a magnet or a lens to attract or create spiritual vibrations. According to the Upanishads, ancient writings from India, the mantra has its origin in the eternal and unchangeable substrate of the creation. Mantras existed in this substrate and caused the creation of the universe. Early seers and sages have made a study of the effects of sound or vibrations and in this way composed the specific combinations of sounds that are now established mantras. In Sri Lankan Buddhism, it is considered evil to kill other forms of life. The use of chemical pesticides, therefore, is not consistent with the faith as it kills insects and other living organisms. In the tradition, several spiritual practices have been developed to relate to the spirits of the different living organisms. Mantras play an important role there. The spiritual leaders know what mantras to use to achieve specific effects. There are mantras to ask rats to leave the field, mantras to enhance a healthy crop and mantras to reduce the damage by paddy bugs. The mantras address some invisible spirits who is believed to grant redress. The words used, the sounds made and the rhythm of the reciting is important. Some mantras are very short and may consist of just a few words. Mantras are used in agriculture to obtain higher yields and also to protect crops from damage by pests and wild animals. Yantras are symbols that have been given the powers by mantra or pirith chanting by a sacred person. It can have the form of a drawing, an idol or a structure. Some yantras are inscriptions on a thin strip of copper or palm leaves. These inscriptions can represent gods, spirits or be abstract geometrical figures or texts in Sanskrit or another language. Yantras are used to secure protection from one s enemies, the anger of the gods or evil spirits, ill effects of planets, forces of nature, envy and the evil eye. They can also help to ensure good crops or good health. In agriculture, the use of yantras is widespread. Generally a yantra is placed in the centre of the rice threshing floor. An abstract geometrical drawing is used: three concentric circles and eight radial lines with different drawings on the outside: The yantra is placed or drawn on the threshing floor, certain items such as an oyster shell, a coconut, a piece of iron are placed on it, together with a few bundles of paddy. During threshing operations no item is referred to by its real name. The idea is to mislead the spirits so they may not know that a threshing operation is going on. Other yantras are used for crop protection: against flies, rats, and for animal health. During one of our field visits we discussed the use of yantras with the farmers. One of the farmers remembered that his father made use of these, and that he should have a booklet with the designs of the yantras in the attic of his house. He found the book. The pages had turned yellow and some pages were missing. It contained some 20 abstract geometric figures each referring to a specific plague or pest. We copied the booklet and have since shown it to several other farmers. In many instances they were recognised by traditional leaders as consistent with their own knowledge. Other farmers were eager to copy the drawings to test them in their fields. After the kem is performed, the chanted and energised water is sprinkled over the rice field. Rats, mice, elephants, wild boars and insects are asked to leave of only take a fair portion of the crop. After a training is given by the Ecological Conservation Organisation (ECO), the farmer (centre) recalled that his father used to keep an old booklet on his attic. 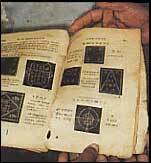 He traced it and found the remaining pages showing some twenty symbols and yantras for crop protection. The practice of kems is very widespread in rural Sri Lanka. A kem is a kind of practice, technique or custom that is followed in order to obtain some favourable effect such as relief from a specific illness. For example, washing in a pool of water immediately after a crow washes in that pool is believed to bring relief to people suffering from certain infirmities. A requirement in this kem is that the patient should wash without speaking or making much noise. The following kem is used for protection against the paddy fly. 'Go to the paddy field early in the morning, catch a fly at the entrance of the field, chant a specific mantra seven times and then release the fly'. Another one is: 'Charm some oil with a specific mantra and light an oil lamp at dusk at the farmers home and not in the field. To prevent crop damage by birds charm some sand and sprinkle it in the field'. Some kems combine the use of astrology with the use of certain plants or herbs. Other kems depend on the use of specific plants and mantras. These traditional practices have survived because they must be effective. If these had no real effect, they would have disappeared long ago. There are also kems that do not involve any belief in spiritual beings or gods. These kems are based on a careful observation of nature and natural phenomena. The kem practised to destroy the paddy caterpillar belongs to this category. It works as follows: milk rice is prepared and put on circular slices of banana leaves, placed on tree stumps which are located in those parts of the field where caterpillars have infested the crop. This is done very early in the morning before the crows leave their nests. When the crows perch on the banana discs to eat the milk rice, the milk rice falls to the ground. When the crows pick up the fallen milk rice, they see the caterpillars and eat them instead of the milk rice. A variation of this practice is to keep roasted grains mixed with pieces of fruit in the evenings before sunset. This attracts carnivorous birds who destroy the caterpillars. Here, it is not the farmer who kills the caterpillars. So he does not commit any sin, which is an important consideration in Buddhism. This kem is an example of how traditional practices are based on knowledge of nature and religion. Some kems are mechanical methods, like the lighting of fire torches. These torches are made using a piece of saffron robe for the wick and sticks of trees wara (Calatropis gigantea), kadura (Pagiantha dichotoma) or gurula (Leea indica) for the handle. The wick is dipped in butter oil or fat. A number of these torches are lighted and kept burning for about two hours at dusk. Most pests and insects are destroyed in this way. This is really a light trap. But the colouring used for the robe and the chemical properties of the selected sticks give extra effect. Today, some farmers may even use engine oil and cotton waste to make these torches. It is also believed that the torches will drive away evil spirits such as demons and pretas. There are various conditions that have to be met to make the working of kems successful. For example, the farmer should not visit the field being treated for a specific period. This period of prohibition may be one, three or seven days. With some kems, women are prohibited from entering the field altogether, while other kems have to be performed by women only or even by pregnant women only. The effectiveness of a kem can be nullified if the person is exposed to a killa or impurity caused by eating certain food (especially meat). Attending a funeral also causes impurities. Another major impurity is associated with women's menstruation. Indigenous knowledge associated with the practice of agriculture and irrigation survived for over 2000 years due to the unique institutional system that supported it. This institutional system was made up of many components and organised as a hierarchy. At the base, there was the village - the smallest unit. Each village was under a gamsabha or village council. Each village also had a village chief. A number of villages formed a korale which was the next higher level. Next came ratay mahattayas and even larger divisions were called disawas. At the apex of this pyramid was the king who possessed unlimited power. Any problem that could not be resolved at the local level was referred to the higher levels. Village temples and devales with their priests also enjoyed a certain degree of power. Then there were practitioners of Ayurvedic medicine. The pirivena was the only formal education institute. This is a school attached to a Buddhist temple of worship. While religion was taught by Buddhist priests, the other three sections of the indigenous knowledge system, namely medicine, astrology and ritualism were taught by masters (gurus). In the passing down of this knowledge from master to pupil, some important sections were deliberately kept back without being passed down to the pupils. This practice of retaining some knowledge was referred to as guru mushtiya. The knowledge was hidden for the pupil and only given when the master died. In many instances, knowledge retained by the master in this way was lost forever. This entire knowledge system is written in ola scripts. Young leaves of palmyrah trees are treated and seasoned in a particular way to produce a writing surface. The teachings of Lord Buddha are also written on these ola scripts. These writings can be categorised into four main fields: Dhamma, medicine, astrology and the category dealing with spirits, yantras and mantras. The Dhamma books also contain remedies for crop damage, pest attacks, damage from wild animals and also advice for improving yields. The medical book contained methods of treatment for crops. These remedies are described as Vrkshayurveda: Vrksha means trees and Ayurveda means treating sicknesses and physical disorders. A large number of remedies, rituals, and the use of spirits can be found in the section covering astrology and spirits. These prescriptions have been safeguarded as secrets and some have been passed down orally. These indigenous systems began to disappear with the advent of westerners. The gamsabha was abolished in 1832. The gamarala was replaced by an officer called the velvidane in the 1860s. The velvidane's functions related only to the cultivation of paddy. Other components of the farming system such as highland and livestock farming were neglected. Agriculture in the villages came more and more under the influence of bureaucrats who were outsiders. Then modern technology entered village agriculture. The Waste Lands Ordinance was an enormous blow to indigenous agriculture. This law introduced by the British, enabled them to buy up land at very low prices. Coffee plantations were established and later tea and cocoa were planted. Natives lost access to the land and this destroyed village agriculture. Christian missionaries came from an entirely different socio-cultural and religious background and did not appreciate the value of indigenous practices or beliefs. Some of them deliberately suppressed and ridiculed them in order to introduce their own beliefs and practices. The present institutional arrangements favour individual activity rather than communal or cooperative efforts. Paid labour was introduced into village agriculture that until then had depended on the mutual exchange of labour. Agriculture became an economic pursuit, and no longer a way of life. As a result, human values, respect for nature and cultural considerations all began to disappear. The introduction of science-based education accelerated this process further. Modern science has not seriously studied indigenous knowledge. Instead of subjecting it to scientific study to test its validity, scientists tend to dismiss it as a myth. Agricultural scientists do not seem to have much faith in indigenous knowledge. Yet, the rejection of indigenous knowledge has led to the disturbance of the ecosystem. Crop failures are frequent due to non-adherence to cultivation time schedules. One can also observe a revival of the interest of agricultural scientists in traditional practices, including their spiritual aspects. One promising feature is that Integrated Pest Management methods in agriculture are likely to gain popularity over chemical methods in the next few years. Many traditional methods are now included in IPM of rice pests in Sri Lanka. In the north, central and the northwest Province, although certain changes have occurred in the practices, methods and techniques related to agriculture, by and large the traditional way of farming has been preserved. Many farmers use both modern as well as traditional methods. Almost all farmers use fertilisers and agro-chemicals. At the same time they adhere to traditional practices such as making a vow to gods when cultivation begins. They fulfill this vow at the end of the season. This also takes place in the colonization schemes established by the government. More farmers are now using modern pesticides rather than indigenous techniques. This is due to the propaganda carried out by agricultural officers and chemical companies. In some places, for example, conditions favour the adoption of traditional techniques. The availability of practitioners of ancient techniques helps to get them adopted in some areas. Many farmers have now realised the serious negative consequences of modern methods. Identification of areas where aspects of indigenous and cosmovision-based knowledge is currently being practised. Collection of available information on availability of competent persons that can apply these methods and techniques and comparing these practises with modern technology. Examination of constraints, if any, that may prevent the widespread application of cosmovision-based techniques. Verification of the effectiveness of cosmovision-based methods and techniques practised by farmers. These verifications can be carried out by volunteer farmers who carry out tests on their own fields. Techniques found to be effective are introduced to farmers by training resource persons and making the services of the latter available to them. Increasing awareness in the form of seminars and workshops for farmers, NGO officials and government officials, in which the experiences of farmers and researchers are discussed. Successful case studies to be given publicity through the mass media. The above programme was implemented in Polonnaruwa District and generated a lot of interest among the farmers. Many more farmers will participate, as over 100 demonstrations are now being planned. These demonstrations will show the farmers how the application of cosmovision-based technologies can help them solve the problem of low yields, persistent losses and damage to the environment. Most of these techniques, practices and methods are environment friendly, do not involve high costs and are also culturally accepted. Fortunately many participants have offered to train selected youths from different parts of the country to use these techniques, practices and methods. There has also been a suggestion that a private library be organised that would be accessible to recognised practitioners. The next step is testing on a small scale. Small plots are selected for this process. Observations are made and tests carried out in these plots. Since these tests are duplicated in a large number of plots, the results are acceptable. Successful techniques are immediately adopted by farmers in the neighbourhood. This ensures that successful techniques spread to other areas . Buddhist temples are important places with respect to indigenous knowledge, because priests in charge carry out indigenous practices such as charming water and sand. The close relationship that exists between the rural people and the Buddhist temples are a great help in popularising indigenous knowledge. Buddhist priests have close contact with farmers and moreover they command respect among the farming community. When we organised workshops in the context of this study, the participants became so interested, that one of the NGOs - Janodaya - offered to organise a workshop in a temple so as to provide practitioners with the opportunity of contributing more towards popularising indigenous knowledge and cosmovision. The chief incumbent of this temple was himself a resource person. Another workshop was held in Kaudulla, in the Polonnaruwa district and was attended by resource persons, NGO officials and practitioners. This workshop too was very successful and many participants revealed the effective techniques they used. The meeting ended with a resolution to apply indigenous methods in agriculture together with certain modern ones. The success of this workshop led to the organisation of two more similar workshops that received assistance from the local agricultural society. Now the farmers themselves have organised another workshop and have even undertaken to provide its participants with lunch and refreshments. Since farmers have now realised that farming is not profitable with modern technology, they are looking for alternatives. There is clearly scope for the popularisation of indigenous knowledge and cosmovision. The Ministry of Agriculture is also now involved in experiments with cosmovision - based practices. At the end of 1997, a series of farmers exchange meetings were organised for their staff. Kalyani Palangasinghe, one of the Sri Lankan COMPAS partners, describes how such a meeting was organised. 'With the help of farmer leaders, I identified key people: those who have a spiritual function, knowledgeable farmers, Ayurvedic doctors. Also people with an interest in the subject were invited. Farmer leaders are respected in the community and know their own culture well. The objectives of the meeting were discussed with the resource persons: to present to farmers the spiritual practices that are being used in the tradition and specifically how they should carry out their roles. In Sri Lanka, shamans carry out rituals to influence the good growth of the crops by enhancing the powers of sound (mantras) and symbols (yantras). These rituals have to be performed at auspicious times, to be determined by astrologers. The shamans undergo extensive apprenticeships, have to be inaugurated and should live a pious life. These shamans were asked to reveal the mantras they are using, show some of the yantras and make a demonstration of a certain ritual. Other shamans were asked to make a drawing of the ritual they generally perform on a piece of paper of a size large enough to be presented to the meeting. My role was to pre pare and facilitate the meeting. We made use of traditional symbols and ceremonies to introduce the meeting. An oil lamp was lightened and mantras were intoned. There was a demonstration of a ritual in the farmers' meeting. It is very important to search for the right resource persons. We also made a kind of healthy curative oil, and gave a small demonstration which immediately shows its applicability. The farmers were very enthusiastic. They sensed that in this way their knowledge, their culture and their spirituality was respected. The meeting lasted longer than usual. Even after the meeting farmers continued discussions. Most of the participants wrote down the mantras, and in some cases they recognised them from the time their parents had used them. The results of the work by COMPAS further helped build the network and different organisations, farmer groups and individuals in different parts of the country are now working on cosmovision. The most important lesson was that during sharing workshops, farmers readily accepted the idea of testing, experimenting and further validating the methods. The involvement of officials of the Ministry of Agriculture, and various other government departments and research institutions, and district administrative officials in various capacities needs to be further strengthened so that use can be made of their capacities in order to further understand and develop cosmovision-based ecological agriculture. In the coming years, we will engage in a number of activities. First of all, we will reinforce the interest among farmers in experimentation in order to test and improve indigenous and effective traditional farming techniques. Farmers will be the main actors, but we will also intensify the relations with support organisations. Possibly, collaborative experiments will be executed with other national and international research institutes. We also hope to contribute to building theory to explain the results. We also intend to continue collecting and documenting information on indigenous knowledge and cosmovision, their concepts of life, and indigenous institutions. Key persons, both men and women, will be interviewed, life histories will be studied and village workshops will be organised to study and discuss the topic and share information with other traditional farming systems. Participation in village festivals, rituals and other important events will be central. The documentation will not only be in written form, but also in audio and video records, slides and photos, and also through indigenous expressions with local media, local symbols, music, songs and designs. It will be interesting and challenging to conduct exchange visits between villagers, village leaders and spiritual leaders. In order to present the information to a wider audience, we also intend to conduct national and international seminars and workshops. Field staff will be further trained and supported in order to assist field staff implement these activities with farmers. We hope to establish clusters of traditional leaders and farmer groups, in which the methods used by the various farmer groups will be documented, discussed and their effectiveness assessed. In order to exchange and agree on the approaches to be used, national, regional and village level working groups will be established. We also intend to do intense networking with governmental and nongovernmental institutions, but the farmer groups who intend to continue with indigenous practices will have most of our attention. To meet the demand of partner organisations that are working with farmers and are interested in this approach, we offer support with documentation, testing and the improvement of traditional techniques themselves. We hope to establish a field laboratory where we can also do some of the testing ourselves and strengthen our cooperation with Buddhist priests and traditional shamans.